Hey there crafty friends, SumMore Fun is doing their first ever new release week. They are having 4 days of sneak peeks and then a blog hop on Thursday. Woohoo, right? I’m joining SumMore Fun in their first day of sneak peeks in which me along with some other lovely designers are show casing their new Crocus Carvings stamp set. 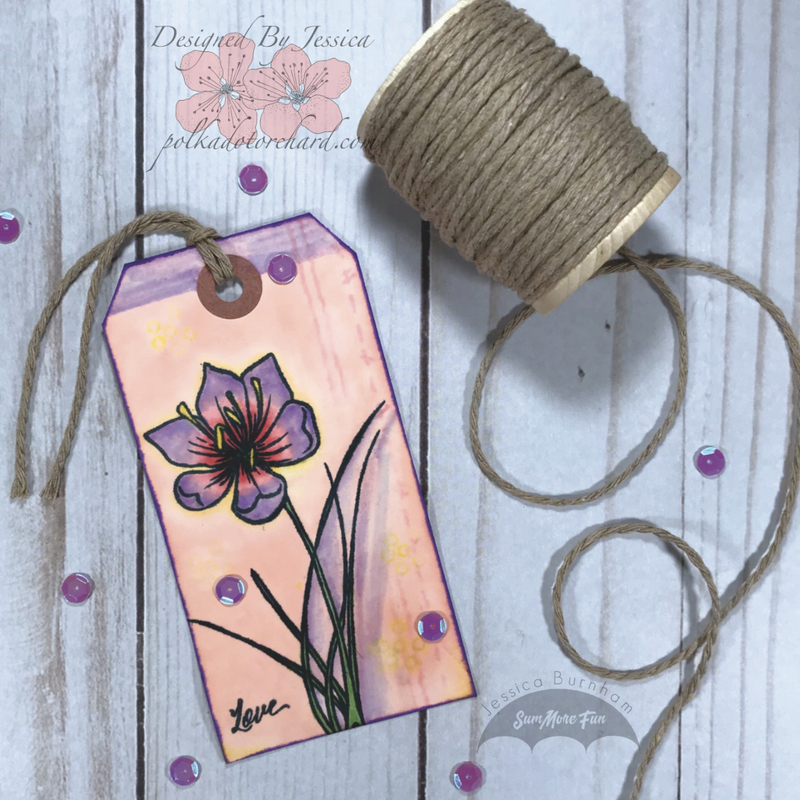 I used a flower and the word “Love” from the Crocus Carvings stamp set to create this lovely tag. I first took a blending tool and Spun Sugar distress ink to a manila tag turning it into a soft pink tag. I then stamped my image and word using my MISTI stamping tool and black Memento ink. I then smashed my distress ink pads (colors listed below) and used a waterbrush to pick up the ink and paint my flower. I was very careful not to oversaturate the tag to avoid tearing the paper. I also painted the same ink colors throughout the tag. I felt the tag need a little more so I pulled out my border stamps and added a bit more detail. I also added some circle dots to the tag using a stamp from the Imagine stamp set. I didn’t like how bold the borders and circles looked so, since I stamped them with distress inks I was able to dab a little water on them with my waterbrush which faded them out a little. I finished up the tag by adding some sequins and looping some tan twine through the tag hole. For more sneak peek inspiration head over to the SumMore Fun blog and check out the other designers creations. Such a pretty tag! Love the crocus! Lovely coloring. This is beautiful! Love the lavender shading and sequins. They both add depth and interest to the tag. Thank you for your tag. It’s fantastic! I’m so delighted you joined us for sneak peek day. What a STUNNING tag! I love your colors!!! The lavendar shading is gorgeous! Your tag is beautiful! I love the different colors of Distress Inks you used to create it. I would totally use this tag as a bookmark! Beautiful tag! Love the colors! What a pretty Tag! So lovin’ that flower!